Hildo Krop rugs – The renowned Dutch sculptor and designer Hildebrand (Hildo) Krop (1884 – 1970) is one of the most versatile and multifaceted artists active during the 20th century. A singular talent, Krop is responsible for designing some truly magnificent vintage carpets. Originally employed as a pastry chef and cook, Krop is one of the proverbial Renaissance men skilled in drafting, stone carving and sculpture as well as ceramics. As the city sculptor for Amsterdam, Krop was heavily involved with architects from the Amsterdamse School creating decorative and architectural sculptures and carvings, which are displayed throughout the city. 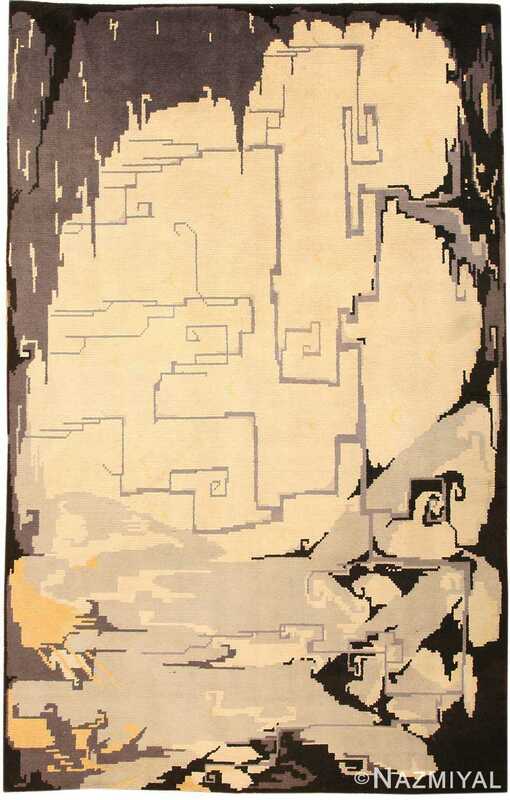 As an extremely gifted designer, Krop also created designs for carpets, furniture, pottery and decorative items that combine influences from Art Deco and Art Nouveau design movements. During the middle years of the twentieth century, artists such as Krop took on large social roles; in addition to designing, artists of Krop’s caliber were also side social commentators, whose work is a living record of the cultural attitudes that prevailed during their creation. While this beautiful antique carpet is a study in modernist abstraction, it still may conceal a wealth of traditional Oriental forms.